Passing kidney stones can drop you to your knees in agonizing pain. Learn what home remedies for kidney stones work to help pass them and prevent them. Kidney stones (calculi) may occur anywhere in the kidneys or ureters and are caused by crystallization of various substances in the urine, often when the body id dehydrated, causing the urine to be more concentrated. Dehydration alone; however, will not cause the formation of stones. There is usually some other factor involved, such as kidney disease, infection, a bodily disturbance such as a obstruction to the flow of urine , or certain drugs. Most stones are a combination of calcium, magnesium, phosphorus, and oxalate. Collections of small kidney stones are known as gravel, while much larger ones are called “staghorn” calculi. While some kidney stones may not produce symptoms (known as "silent" stones), people who have kidney stones often report the sudden onset of excruciating, cramping pain in their low back and/or side, groin, or abdomen. Changes in body position do not relieve this pain. The pain typically gets severe and then lessens and then gets severe again, it may be so severe that it is often accompanied by nausea and vomiting. There may also be blood in the urine. CELERY SEEDS: Can help dissolve stones. Simply boil 2 cups of water and then added 2 tablespoons of celery seeds. Cook till the seeds are soft and then strain the seeds from the water. Drink a ½ cup once every hour. URINARY MAINTENANCE: This product supports the urinary system and kidneys; helps maintain the body’s delicate fluid and mineral balance; supports the blood vessels and promotes urine flow; and helps sanitize the urinary tract and boost the immune system. GOLDENROD: Used to treat or prevent kidney stones. Has the ability to flush water from the body, along with anti-inflammatory and antimicrobial (ability to fight infection) properties. Add 2 - 3 tsp of dried herb in one cup of hot water and let stand for 10 -15 minutes. Strain and drink 3 times daily. Be sure to drink plenty of water throughout the day when taking this herb. 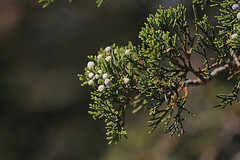 JUNIPER: Add a few drops of juniper oil to your bath for a relaxing, soothing experience. You can also add it to a light carrier oil and massage it into the bladder area to relieve kidney stone pain. GERANIUM: Add a few drops to your bath or add to a light carrier oil and massage into the bladder area to relieve kidney stone pain. VITAMIN B6 Extra intake will help with the pain and also with the prevention of kidney stones. NUTRI-CALM: Loaded with b vitamins and will help calm you down and rest. Magnesium: Try to include foods with a good source of magnesium in your diet such as whole wheat bread. OLIVE OIL: Include 2 tablespoons of extra virgin olive oil in your diet each day. Will also aid in passing kidney stones. LEMONS: Fresh lemon juice, drunk in a little hot water every morning will help to flush the kidneys and break down kidney stones. WATER: No-brainer...drink lots of water to flush out the kidney stones. 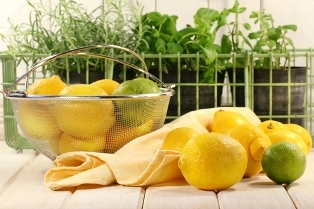 Can squeeze some fresh lemons in to aid in breaking down the stones and passing kidney stones. COKE: Okay my son gave me this one. His best friend had a severe kidney stone attack and the doctor told him to go home and drink a 6-pack of coke (room temperature) as quickly as possible preferably within an hour's time. My son said it dissolved his friend's stones quickly and painlessly. CRANBERRIES: 300 - 400 mg daily, for kidney health. You may also drink 8 - 16 ounces of unsweetened cranberry juice daily to help prevent kidney stones. GREEN TEA: 250 - 500 mg daily, for antioxidant and immune effects. Use caffeine-free products.